Rev. (Evang.) Timothy Osemudiamen O. is the President of The Rhema Interdenominational Ministry. This is an End-time Ministry empowered by grace with the aim of winning souls into God’s Kingdom and equipping the saints in the body of Jesus Christ. He is a Baptist-ordained minister of the gospel, a dynamic public speaker and a prolific writer endowed with His grace and wisdom from above. He had his Bachelor in Theology (B.Th) from the prestigious Baptist Theological Seminary, Ogbomosho in Oyo State of Nigeria. 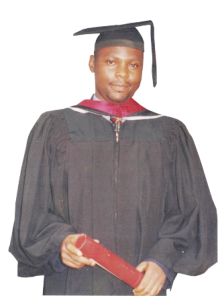 He also obtained his Bachelor of Art in Religious Studies (B.A) from the great Ambrose Alli University, Ekpoma in Edo State of Nigeria. He has acquired ministerial experience for many years by nurturing the following churches: City of God Baptist Church, Okpekpen, Ayogwiri Baptist Church, Ayogwiri, Redeemed Baptist Church, Iguovbiobo, Calvary Baptist Church, Uromi, Messiah Baptist Church, Ekpoma; all in Edo State of Nigeria. By His grace, he had been called by God into The Rhema Interdenominational Ministry. He is happily married to his begotten wife, former Miss Doris Akhimien with three children namely; Rejoice Eseohe, Shalom Ofure and Theophilus Osemhuanhu. To God be the glory! The next step was to relocate to Auchi the land of my nativity. I have already secured accommodation and paid for a year. But the following week, something terrible happened. I was so fed up with life that I made attempt to commit suicide. At midnight on the 25th of May 2015, I took 26 tablets of Atanalol 50 mg each. As soon as I took them, I heard a voice clear and loud saying to me, “You are antichrist, if you die you will go to hell?” The voice kept repeating it loud and clear, and I could not resist but to scream out. The scream woke up my wife, immediate elder sister and her husband; and I told them what happened. They were confused and did not know what to do next but made some calls to my siblings that midnight and later rushed me to UBTH at the emergency ward. Thank God that a doctor was on ground that midnight. God used him to neutralize the adverse effect of the drug. The following day, I was discharged and asked to be coming for check up fortnightly. After my discharge, God asked me to settle down in Benin City because it was the place where He saved my life. In June 2015, God gave me a text from the Scripture in Isaiah 43:19; He asked me to be praying with that verse together with my family. We were praying with the verse morning, noon and night continuously. Of course, between June and November 2015, God took control and started showing me greater things through dreams and revelations. Then He gave me this ministry, The Rhema For Your Daily Victory. When God revealed this ministry to me in dreams and revelations, I was scared because I knew that writing ministry is very demanding, tactful and herculean. But He told me vividly that the reason why He allowed me to go through all these trials was to prepare me for the ministry. He assured me that His grace is sufficient for me. He warned me vehemently that no Church will extend a call to me and if I disobeyed Him I will die and go to hell. Again, I was afraid of taking a loan and running at a loss but He assured me that no one ever invests in His Word and run at a loss. He went further to inform me that this ministry is now your project, assignment, business, job and profession. When I was still scared and reluctant, He told me that you did man’s project in your Post Graduate Studies at Ambrose Alli University and man frustrated you to the extent that you almost died. He asked me to do His project if He would not bless me beyond man’s imagination. He further told me that I should not be afraid of what to write because He would teach and dictate to me. He revealed to me the formulae, style and methodology to use. As soon as I started writing on the 5th of November 2015, my life changed and was totally transformed. I had peace, joy and fulfillment like never before. In fact, for three good years that this trial lasted, my wife and I were not working. We apply to so many places in Ekpoma and Benin City but to no avail. How did we survive it without salary from anywhere? I cannot explain but all I know is that God sustained and kept us healthy by His grace. To God be the glory! You may be passing through similar situation in life or probably yours may be worse than mine, but learn to look up to God. You should never for any reason put your trust in man because he is bound to fail and die. With God on your side nothing is impossible. Whatever situations or challenges you are going through in life, kindly sow a seed into this ministry as led by the Holy Spirit into: UBA, OKHOMHEN TIMOTHY, 2031305611 OR ACCESS BANK, OKHOMHEN OSEMUDIAMEN TIMOTHY, 0054808436. Send me a text message of confirmation and a summary of your challenges (+234-8051430395; +234-8035196707). I shall reply you with a prophetic declaration from God. I promise to join my faith with yours in prayers because that same awesome grace of God that saved me and my family from death and doom, and put us on the path of success and breakthrough in life shall be your portion. Apostle Paul said in 1 Corinthians 3:6, “I planted, Apollos watered, but God gave the increase.” Even as God has used me to plant this ministry, I urge you to kindly help me to water by sowing into it being led by the Holy Spirit, and you will reap more than a hundred fold in Jesus Christ Name! Amen. Take note of the fact that with God all things are possible. You shall be the next to testify of the goodness of the Lord in the land of the living. Shalom and God bless!